In the fourth book of the Bloody Jack series, Jacky Faber, having been called a pirate and had a price put on her head by the King of England, has no choice but to stay out of sight. Hoping for a safe hiding place, she returns to the Lawson Peabody School for Young Girls in Boston, but the calm doesn't last long. On a class field trip to Boston Harbor, the girls are abducted and forced into the hold of the Bloodhound, a ship bound for the slave markets on the Barbary Coast where they will be put up on the auction block and sold into Arab harems. Jacky wouldn't dream of going down without a fight, but the delicate Lawson Peabody girls are in over their heads. Although Jacky will use anything in her arsenal to help her well-heeled classmates, she isn't so certain they will find the strength and courage needed to survive. But if she can convince them to trade petticoats and propriety for her daring escape plan, the girls just might become their own rescuers. "Kellgren takes listeners on a rollicking action-packed journey as irrepressible Jacky outwits a hardened crew and turns a bunch of privileged princesses into a formidable fighting force. 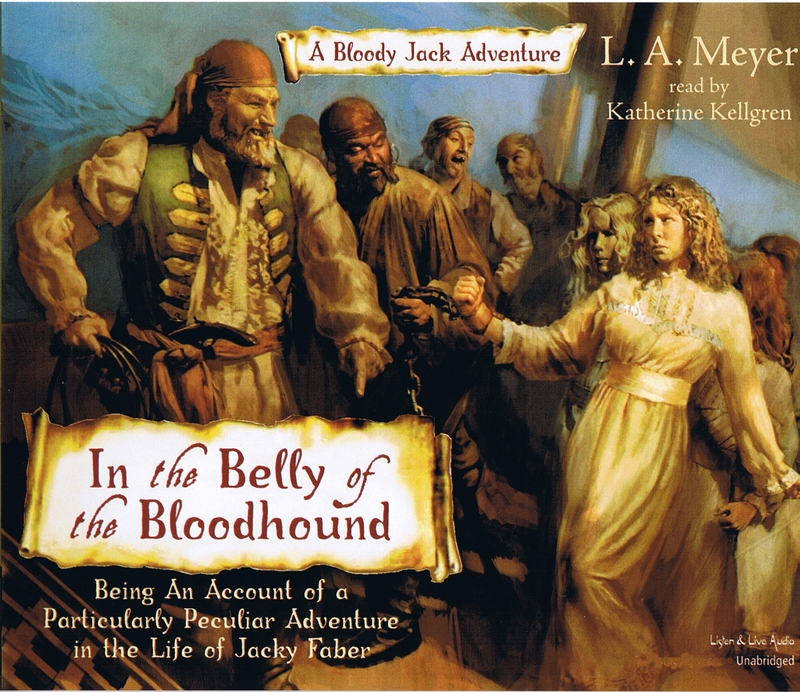 Jacky encounters thrill-a-minute dangers -- from a near-hanging to a brutal whipping, from near-starvation to dining on the ship's plentiful rat population. Kellgren delivers a bravura performance." "Real pleasure comes from this cunning, unconventional, warmhearted heroine." "Jacky's exploits are astounding and hair-raising." "In the Belly of the Bloodhound is the unabridged audiobook adaption of a thrilling and empowering novel for young adults, especially young girls! Jacky Faber has been named a pirate by the young King of England, and a price has been put on her head. She sought to hide amid the Lawson Peabody School for Young Girls in Boston, but during a class field trip to Boston Harbor, the ruthless crew of the slaver ship called the "Bloodhound" abducted the girls for auction into Arab harems. Jacky is ready to fight her captors, but the Lawson Peabody girls are out of their element--and in need of Jacky to show them the importance of finding one's courage! Only by relinquishing rigid adherence to propiety can they become their own rescuers from a desperate situation, in this enthralling saga of rising past societal expectations to meet a dire challenge. Also highly recomended, especially for public library children's audiobook collections, is My Bonny Light Horseman.